If you enjoy sitting at home in front of your desktop and playing a few hands of digital poker against your buddies or complete strangers, you probably get a little peeved every time you have to go to work or pick up your kids from school. Luckily, you can download a free app called PokerStars Mobile from Apple’s App Store, and take your mates to the cleaners in ring games, sit-and-go tournaments, and large-scale multi-table events wherever you are using your smartphone. 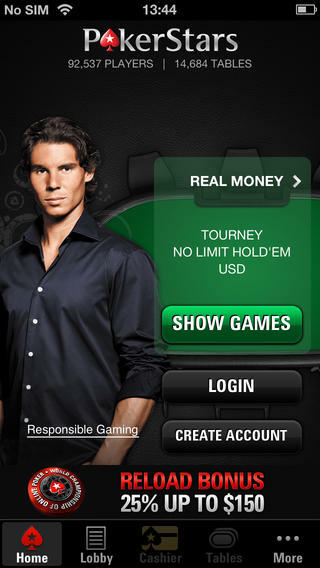 Don’t worry, either: the PokerStars Mobile app doesn’t offer a watered down experience. It’s actually packed full of handy features that you’d only expect to find on your home computer. PokerStars Mobile is, for example, the world’s first mobile app to offer multi-table functionality and other modern features like Zoom, which will instantly transports you to a new table and deal you a new hand as soon as you fold in a previous game. Similarly, there’s a ‘play now’ button that will put you into your favourite games and tournaments with a single click. Just one tap, and you’re in on the action. There are also tons of social features. If you want to search for a specific player and jump right into a game alongside them, you can do just that. If you want to pinpoint a particular tournament that you’re interested in joining or use in-app chat lobbies to contact other players, you can do just that, too. You can even filter lobbies by table size, limits, and stakes for every game, so you only have to compete in the games you really want to compete in. 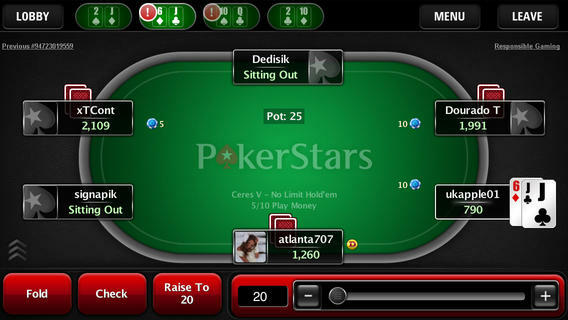 The PokerStars Mobile app caters for both rookie and seasoned players alike. If you’re new to the poker scene, you can play it safe and have a cheeky gamble with £1,000 worth of free play currency. You don’t even have to worry about blowing the lot. If you’re unlucky enough to be dealt a bad hand and lose a stack of cash, you can top up your chips with just a couple of clicks. If you’re feeling a bit lucky and you’d rather play with your hard-earned cash, however, you can easily top up your account using a number of different payment options. The PokerStars team will even match your very first deposit. In other words, add £20 to your account, and you’ll receive an additional £20 to play with. Naturally, if you do decide to use play currency, you won’t be able to compete against players using real currency. That wouldn’t be fair, after all. Sound good? 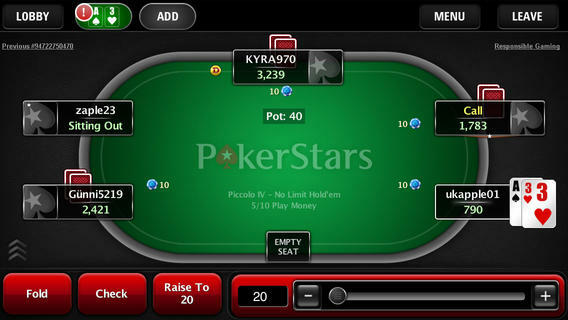 Head on over to the App Store right now and grab PokerStars Mobile for free.